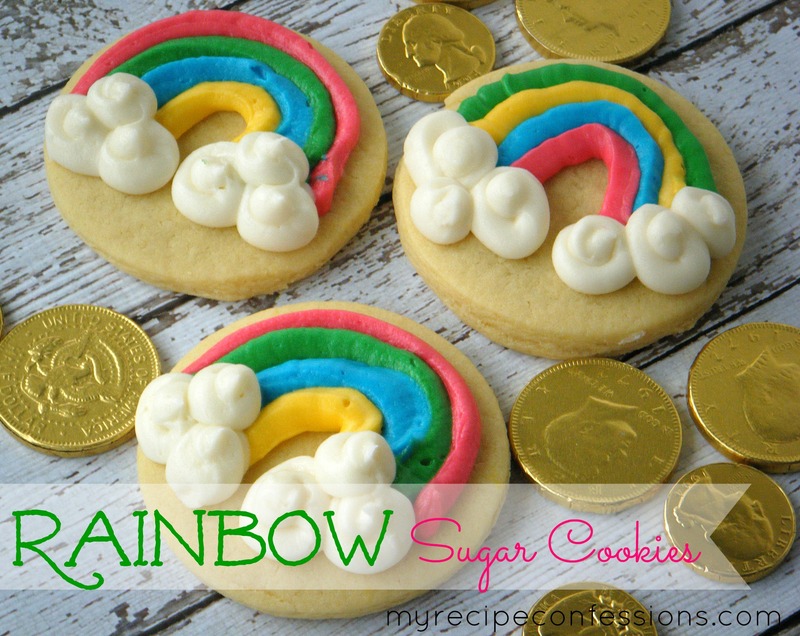 I put a new spin on my favorite sugar cookie recipe. These cookies are perfect for St. Patrick’s Day. While you are at it, let the kids join in the fun and start a new family tradition. Watch my first ever YouTube video (it is a work in progress) to see a step by step tutorial. 1. Place 1 cup of frosting into each of the 5 bowls . Tint four of the bowls of frosting with the food colors of your choice. The last bowl of frosting will stay white for the clouds. 2. Scoop each bowl of frosting into a sandwich bag. Squeeze all the frosting to one corner of the sandwich bag. On the corner with the frosting, snip 1/16 of an inch off the tip of the bag. 3. With the first color of frosting pipe a half circle around along the top half of the cookie leaving a 1/2 inch border around the cookie. 4. With the second color of frosting pipe, pipe a half circle underneath the first half circle. Repeat this process with the remaining two colors of frosting. 5. With the white frosting pipe three tight 1/2 inch circles at both ends of the rainbow.